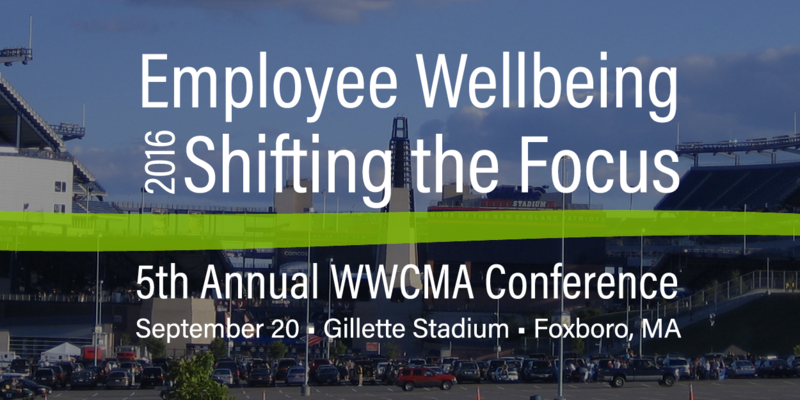 The Worksite Wellness Council of Massachusetts (WWCMA) has announced registration is open for their 5th Annual WWCMA Conference that will take place Tuesday, September 20, 2016 at Gillette Stadium in Foxboro, MA. The Worksite Wellness Council of Massachusetts (WWCMA) announces registration is open for their 5th Annual WWCMA Conference that will take place Tuesday, September 20, 2016 at Gillette Stadium in Foxboro, MA. The 2016 WWCMA Annual Conference, Employee Wellbeing, Shifting the Focus, will feature Dan Witters, Research Director of the Gallup-Healthways Well-Being Index and Allen Campbell, Personal Chef to Tom Brady as Keynote speakers. More speakers and a detailed agenda will be announced soon. Sessions and activities will share innovative best practices, evidence-based resources, and new evaluation measures to shift the focus of worksite health promotion programs from wellness to wellbeing. Over 250 professionals will spend the day at Gillette Stadium full of education, idea sharing, and networking. Attendees include employer-based corporate wellness, benefits, and human resources leaders and staff; industry consultants and advisors; broker program managers, and other professionals in charge of worksite wellness and employee wellbeing. The Gillette Stadium venue enables WWCMA to have an interactive, well-integrated exhibitor area for participants to learn about the latest in worksite wellness tools and resources. The second annual WorkWell Massachusetts Awards will be announced and during the conference recognizing Massachusetts employers for their excellence in worksite wellness. Conference sponsorship and exhibit opportunities are also available.